We are pleased to announce that UCLDH will be working with The Imperial War Museum (IWM) together with Knowledge Integration and UCL CASA on a R&D project to explore digital innovation in the cultural sector. It was announced last week that we are one of eight projects that have been selected to receive funding from the Digital Research and Development Fund for Arts and Culture. 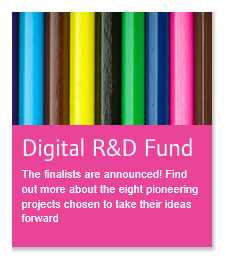 Run by NESTA, Arts Council England and the Arts and Humanities Research Council (AHRC), the R&D fund aims to support cultural organisations to work with digital experts to understand the potential offered by new technologies. It was a really tough process with 495 projects applying in total, 18 shortlisted and we feel very lucky to be one of the chosen 8 projects. During this project, we will explore how social media models can be applied to museum collections, offering new frameworks for engagement and social interpretation. We will be focusing on applying successful social media intellectual and technical models, in order to develop a platform that will enable the interpretation, discussion, collection and sharing of cultural experiences with, and between, audiences. We are hoping to create a system which encourages people to respond to the themes and collections in IWM’s exhibition spaces through several forms of digital interaction and participation both in the gallery, via mobile and online.